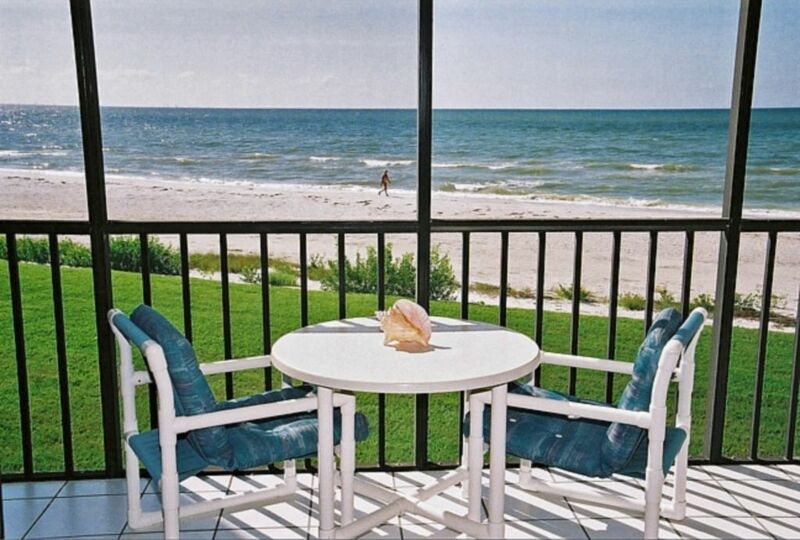 Sanibel Island Florida Direct Beach Front condo vacation rental located at the Sundial Resort. We are one of only 6 one bedroom Direct Beach Front condos at the Sundial Resort and one of only 56 one bedroom Beach Front condos on Sanibel Island. This allows us to provide one of the best values for a true Beach Front vacation rental on Sanibel. Our condo is one of the closest to the beach on Sanibel Island (just 20 feet) providing a spectacular view and soothing Gulf Front breeze from the 25 foot private balcony. We are on the second floor and have an incredible view of the Gulf of Mexico making you feel you are right on the beach. Our condo offers a master bedroom with a king-size bed and Cable TV. Full sleeper sofa in the living room. Fully-equipped kitchen including a full-size refrigerator, self-cleaning oven, microwave, dishwasher and small appliances. There is also a washer and dry located in the condo for your convenience. Free High Speed Wireless Internet also provided. Extras provided: We also provide many extras not offered by other rentals. Binoculars to watch the dolphins, Flashlight for night-time shelling, linens, beach towels, TV, VCR, DVD, movies, books, ironing board and iron, beach chairs, beach umbrella, beach toys, hair dryer, liquid hand soap, coffee filters and a sparkling bottle of wine. Come and enjoy an unforgettable vacation that will have you wanting to return again and again. Make your reservations early as our one bedroom Gulf Front condo is in high demand and can fill up fast. Click on the link below for the owners web site and additional information including availability calendar, additional photos, and a virtual tour. High Quality 300 Thread Count sheets, pillows and pillow cases, bath and kitchen towels, along with beach towels are provided. Extensive DVD Library. Over 50 titles. As close to the Ocean as you can get! Wonderful location with everything we needed. The Condo was spacious and clean with a beautiful view. 4 years in a row and this condo NEVER disappoints!!! Truly only steps from the beach. Perfectly clean. Fully equipped with EVERYTHING you will need including beach towels, beach chairs, beach umbrellas, noodles and beach toys for the kids, plus a cooler. Owner is a breeze to deal with and responds super quickly to and question. We will NOT stay anywhere else. Thank you for another great year. A M A Z I N G!!!!! This is the third year in a row we have stayed at this condo. This is the perfect romantic get away for any couple or even parents with 1 or 2 children. You want for nothing. The condo comes equipped with everything you could possible want; from beach toys for the kids (and you), beach chairs and umbrellas, cooler, shelling bags, fishing poles and buckets. The inside of the condo has everything you need as well; a 12 cup coffee pot and filters, a Keurig, with a couple of cups to get your started, paper products, soft and absorbent bath & BEACH towels; soft inviting sheets and a bed that is sooooo comfortable. There is so much more and it is listed in the owner's description and truly is there for your use. Did I mention the view? What can beat laying in a huge king sized bed with ceiling to floor windows and watching the ocean which is just steps away from your balcony. And last but certainly not least, an owner who is so responsive and easy to deal with. Our vacation was planned right after Irma devastated South West Florida. He communicated with us daily with phone and text updates even though he is not local to Florida. Even down to telling us where we could by food and which restaurants were open. We have rented small places for just the two of us and homes that sleep 10 when we take all the kids and grandkids and NO ONE has ever been as helpful as this owner. He is a pleasure to work with. Sanibel itself is a slice of heaven (especially for a shell junky like me) but this condo is the icing on the cake. You won't regret staying here! My husband and I stayed at this condo for a week and it was absolutely amazing. As others have said, the photos don't do it justice! The condo is spotless clean, very spacious and well stocked. But, OH...THAT VIEW! It was just breathtaking! We have stayed at a lot of ocean front condos over the years (including Maui last year) and this view and ocean sounds have been by far the best! The resort is spotless clean and very quiet. And Sanibel is just amazing. I think we have found our retirement spot. Maybe Tom will be ready to sell his condo to us by then. 🙂 If for any reason you are hesitating about renting this condo, don't. You won't be disappointed! It wasn't just a fluke!!! The second year (we first found this jewel in 2015) was just as wonderful as the first. And we have submitted our request for this year as well. It truly is only steps away from the beach and you can lay in the comfy king size bed and look out at the beach and the gulf. In fact you can see the ocean from anywhere in the entire condo, except maybe the closet!! The condo is immaculate and has everything you can think of to make your stay more enjoyable. They provide everything and I do mean everything. All you have to do is sit back and enjoy. The owner is super easy to deal with and very responsive. You won't regret renting this beautiful condo. If anything the description doesn't do it justice. We look forward to making it 3 years in a row! I am so happy I reserved this property for our recent week long stay on Sanibel Island. The condo is one of the nicest I've stayed at. There were plenty of dishes, cookware, small appliances etc and all were of good quality. The linens were wonderful, complete with nice thick beach towels. Most of the beach condos we've stayed at left a lot to be desired in terms of beach chairs, umbrellas etc.. but not this place. There were plenty of beach supplies and all of them were nice and clean. The furniture in the condo was modern and clean, in fact, the entire condo was spotless when we arrived and there were plenty of supplies to get a through a couple days. I cannot recommend this property enough. It is located right on the beach and convenient to lots of good restaurants and shops. Loved our trip and can't wait to go back! Biking (rental fee), 30 miles of flat bike paths, tennis (fee), 2 golf courses on the island, shuffleboard, fishing (from beach or charter), wildlife viewing, shopping, galleries, excellent restaurants, live theatre, cinemas, day spa, shell museum, historic lighthouse, wildlife preserve, swimming, snorkeling & diving, shelling, boating, jet-skiing, sailing, water-skiing, kayaking, canoeing, hiking, roller blading.